I write this at Dubai airport. I left a very fractured and troubled nation that is the UK, torn apart by a futile attempt to sustain the unsustainable (maintain unity in the largest party in our parliament). Without pinning my political colours to the mast I must confess I despair at the majority decision to abandon a group that has been in part responsible for peace in Europe these last 75 years. The rush towards right wing nationalism across the globe is in no one’s long term interest and terrifies me as does the bellicose rhetoric that passes for debate. It’s a good time to reflect on what’s gone and what’s to come. 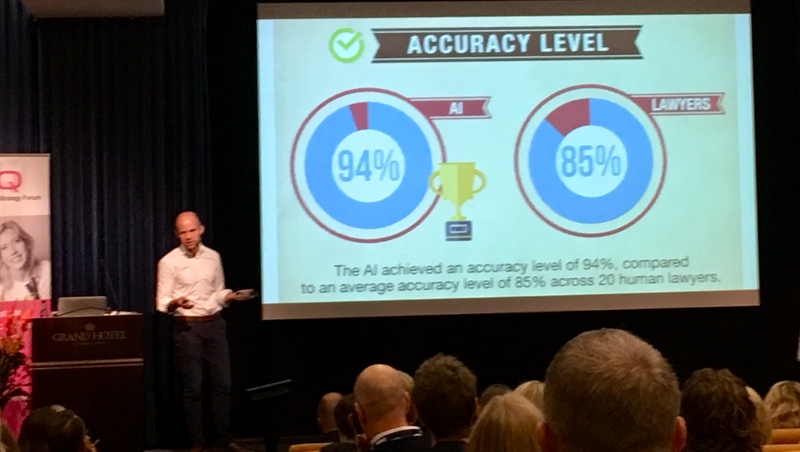 I was interested to see James Robertson and his team at Step Two in Australia post this week that “Knowledge management isn’t dead, it’s more important than ever!” and describe a number of assignments they’ve done at the practical end of KM. That they (an excellent Digital Workplace and Intranet focused group) should highlight the importance of their KM practice feels significant. Knowledge Management (KM) has been around for over 20 years as a set of tools and methods for connecting, collecting and creating knowledge. Lots has been written, and there are tens of thousands of practitioners out there—in-company specialists and consultants. Unlike Lean, Agile and other business improvement methodologies, KM has never had a single agreed set of tools, or a commercial accreditation or standard. 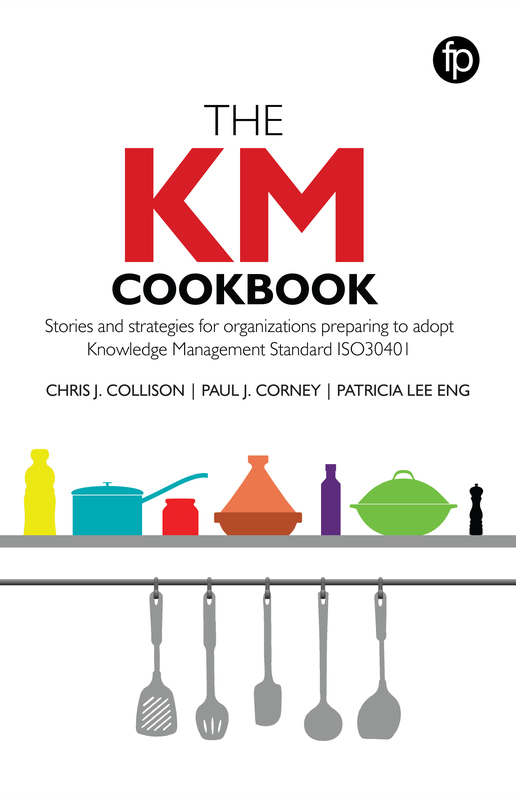 The KM Cookbook written by Chris Collison, Patricia Eng and I serves up a menu of success stories and strategies for organizations wanting to know more about Knowledge Management Standard ISO30401 – whether they intend to pursue certification, or simply seek to use it as a framework to review their existing programme and strategy. In writing this book, we want to catch the excitement of the arrival of this ‘new kitchen’ and to demonstrate how the arrival of the ISO Knowledge Management System Standard (ISO 30401) provides so much more than a moment to certify a level of consistency in practice. It provides a moment to re-evaluate, to return to first principles, and to learn from others. Imagine you had the opportunity, not just to enjoy a new, well-equipped and fully inspected kitchen – but also the chance to sit down with KM ‘chefs’ from around the world, across different industry sectors and listen to their stories. That’s exactly what we have set out to do with the KM Cookbook. Concurrently in my role as Knowledge & Information Management Ambassodor for CILIP I have been assisting them with the development of what we hope will become a globally recognised accreditation for Knowledge Managers. The first cohort of two dozen has being signed up and they are going through a process of submitting a KM portfolio of work for assessment in anticipation of the award of a Chartership in Knowledge Management. The next stop is then Hong Kong for another Masterclass this time with my good friend Eric Hunter followed by presentations / panel sessions at KM Asia 2019.with Patrick Lambe, Hank Malik on the ISO standard and Bruce Boyes, Rajesh Dhillon, John Hovell and Bill Kaplan on KM Accreditation. 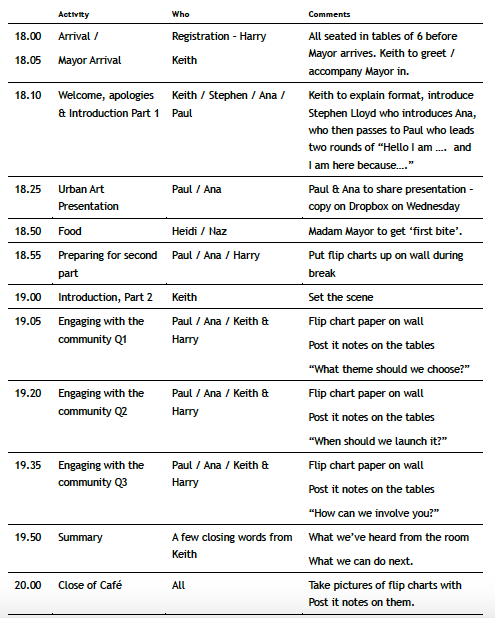 At all these events I will be drawing on the soon to be published “KMCookbook: Stories and Strategies for organisations exploring Knowledge Management ISO Standard 30401” as well as the latest developments in the KM Chartership Accreditation. Then it’s back to the UK for the Thomson Reuters Practical Law event where I will be running a session and speaking, then a co session with Victoria Ward (more of her in a minute) at the UK KM Summit followed by a trip to Lisbon for the launch of the KM Cookbook in Lisbon in early June at one of my favourite events, SocialNow. Looking back to 2018 I had the great pleasure of working alongside Victoria Ward (formerly of Spaknow) on a really interesting KM assignment for a global manufacturingl company. 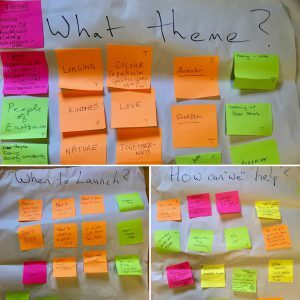 Involving the embedded of KM practices into an organisation undergoing rapid transformation it was challenging and stimulating in equal measure and the use of effective visualisation, personae and archetypes key to delivering on our mandate. As if the above and researching, interviewing and coauthoring the KM Cookbook wasn’t enough I also managed to fit in a couple of Masterclasses in London and Stockholm around the soft skills (the critical 8 ‘ates) of the Knowledge Manager and deliver a few keynotes in Italy and Sweden. Back in the UK it was the 2nd year of operations for the two businesses I helped establish and run, award winning Bees Homes and Coastway Financial. Today is the end of both companies financial years so it’s great to report we are on target to where we wanted to be. Despite all the uncertainty, Brexit is proving less of a challenge as there is a move from vendors towards the type of quality service we are offering. A key statistic for us is “Property Views” online and it’s great to be able to report we are currently #1 in our region. Transparency and trust are important values so we are running “How to sell your property in a post Brexit world” on April 16th at Eastbourne’s swankiest new boutique hotel to share some of the techniques we apply to dress a property to its optimum potential. Our initiative to help with the transformation of our town continues on a couple of fronts. 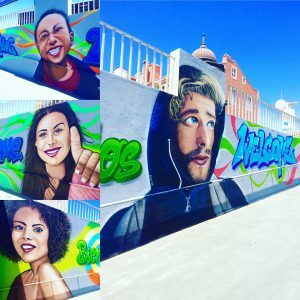 The Urban Art idea has gathered momentum and support from the Municipalities CEO and I am helping him and the regeneration team to attract conferences to the town. 46k is my preferred seat on the Emirates A380 (and the Boeing 777). Check out Seat Guru.com to see why! For the past 20 months, I’ve been wearing a few hats: author; consultant; advisor; and business owner. Substitute years for months and it would also be an accurate account of how I’ve spent most of the last 20 years. Describing that to people is often a challenge. At an event in Dubai, not long after I’d left a full-time role (as a Vice President in a financial services group in the City of London) someone asked me what I did. Expecting the usual answer (Vice President… / Senior Manager….) he was surprised and I hope intrigued when I answered, “I have a portfolio of activities.” It’s a phrase I’ve used ever since. I’d thought long and hard about my response to his question. “Who are you with?” is almost a standard opening line at any meeting during a business event. Those that are interested in the reply will ask you to explain what that means. The majority begin looking over your shoulder for someone else to talk to. We all hide behind jargon and headlines which today’s 24 x 7 soundbite society promulgates. How many times have you read a headline and formed an opinion based on that only to discover that the article that follows says something different? Our challenge is to distil what we do into a phrase, image or name that is concise and memorable, one that makes you smile. 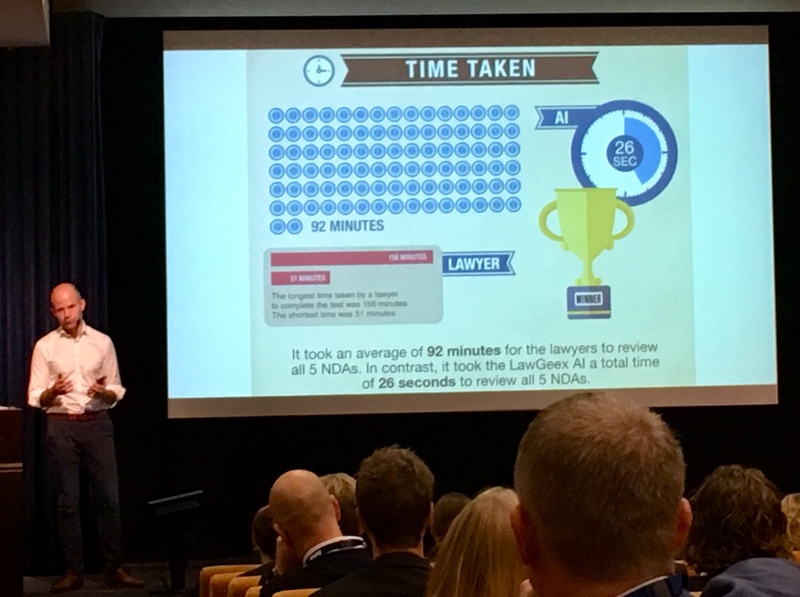 A few months back I ran a Masterclass in Stockholm for Senior Legal Knowledge Management professionals. I invited them to pair up and develop their own concise description of what they did. It proved to be an illuminating session. Promoting Knowledge Management is much like I used to find selling Corporate Finance services – it’s intangible so harder to explain and hence easier to diss. 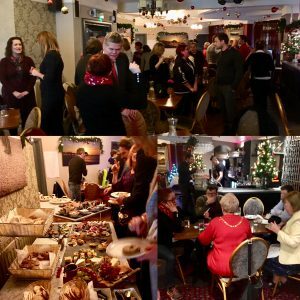 Every couple of weeks I attend a business networking event of one type or another. Participants are encouraged to share their story in a minute or less. The vast majority waste the first 30 seconds describing when they were founded and where their offices are located. Very few put themselves in the shoes of the audience or leave a lasting image or impression. 10% might tell a story. On Monday I spent a couple of hours with a marketing advisor. Part of the UK Govt’s “Let’s do business’ initiative wherein companies can access business advice we were discussing the messages a young business might use to describe what it does and who it is. 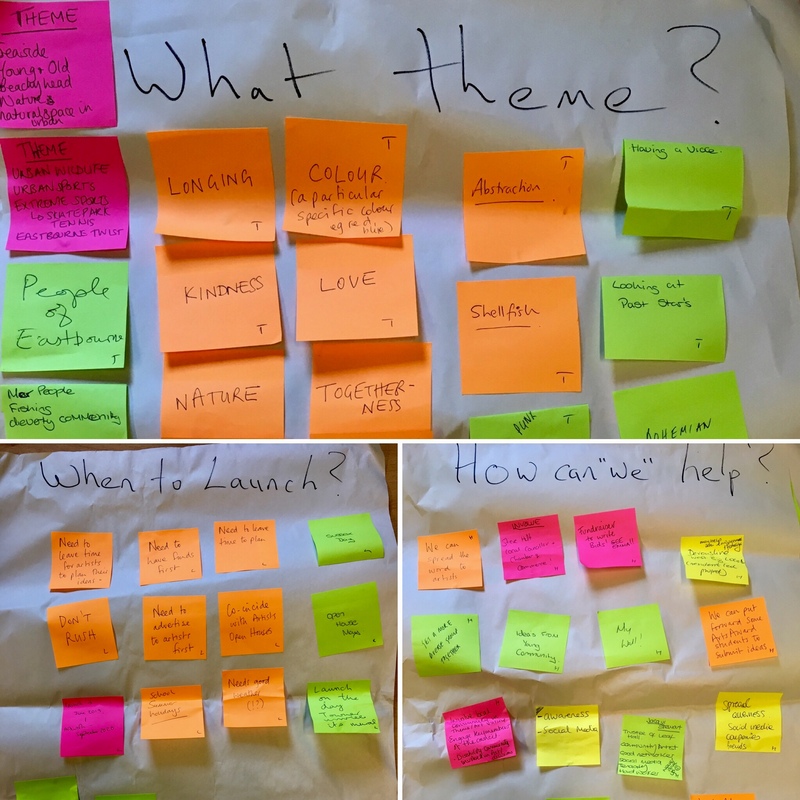 Adopting a persona approach, we mapped words on their online presence (website / Facebook / Google Business) with keywords we thought their target audience might use. We drew on great 5 star Google reviews to see what clients actually said. And we thought long and hard about navigation, images and metaphors. 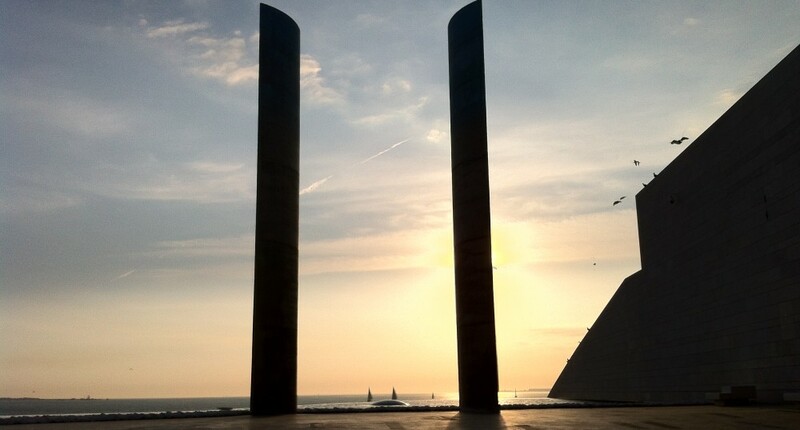 A strapline, “Shining a light on property finance“ with a lighthouse (we live within walking distance of Beach Head Lighthouse one of the UK’s famous landmarks) generated the idea of building on a navigation theme and the idea of using the Finance Navigator Hashtag. #PropertyMatchmakers was a hashtag evolved for Bees Homes a companion business. Supported by a smiling winking bee logo and a strapline,: “Taking the sting out of buying and selling property”, it features the concept of matching buyers and sellers rather than merely advertising a property on line and hoping buyers will come. The bee logo is memorable and portable across gender, ethnicity and generations. The hashtag appears in every social media post. Both companies finish any presentation with, “Here when you need us, not when it suits us” to emphasise that ours is more than a 9-5 business. Valuing and selling property is a subjective art. Ultimately the ‘right price’ is what someone is willing to pay not what the owner thinks it is. The skill of the ‘Property Matchmaker’ (realtor or agent) is to find the right buyer, sell them a lifestyle or image they can relate / aspire to, negotiate a price both are happy with and manage the supply chain to completion. It’s often about making correlations. …as a Senior Manager charged with developing new business, my ability to match a need with a solution was prized and rewarded even though the correlation was opaque to my bosses. More often than not the intuition paid off. But does the same apply today in a Knowledge Management environment where logarithms and Artificial Intelligence are making the correlations I used to make? The idea of making and managing connections and networks came up time and time again albeit called something different during interviews for the KM Cookbook. Where it landed for me was in discussion with a prominent KM’er embarking on a relaunch / rebrand of her organisation’s KM program. They too were seeking a memorable image / strapline / hashtag that could underpin their internal and external communications. Knowledge Management is a thread running through my many consultancy assignments, publications, masterclasses and pro bono activities. Underpinning this is the concept of how to describe or illustrate the value a person or team brings to the business. To illustrate: As advisor to a large reinsurance group I would spend a day per month in their offices in the City coaching different people and teams. I recall a discussion with the compliance team who had a terse relationship with the business who saw them as blockers not enablers. 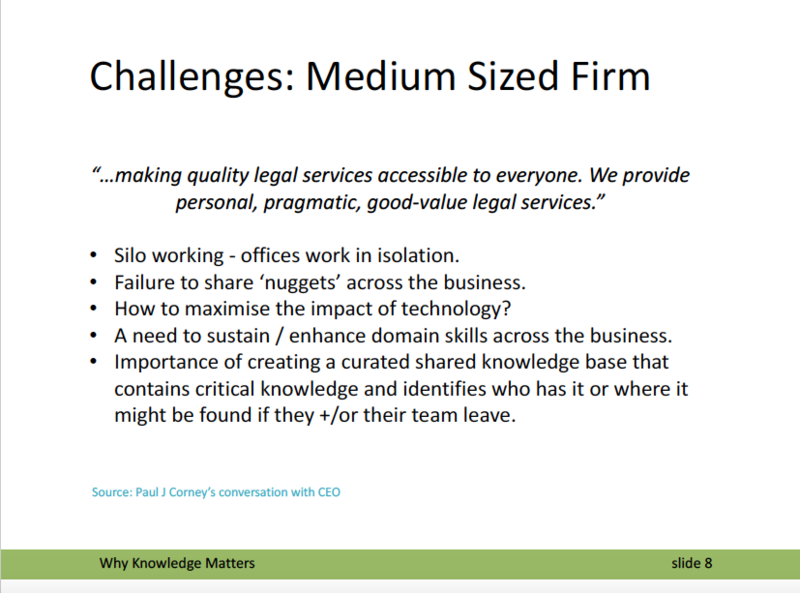 By adopting a business consultancy mindset, it changed the dynamic: people went to ask compliance how best to meet regulations instead of doing it and being told they were wrong. When I was Managing Partner at Sparknow LLP we ran an exercise for the front line staff of the UK’s Museums & Libraries group. We asked them to be “in the shoes’ of their customers, to imagine what it would be like to be on the other side of the desk. It was uncomfortable and required them to get out of their comfort zone to do so. The best presenters are those who tell stories that live in the memory. If you can wrap the three must do’s into a story then you are on the way to creating an effective and enduring presence. Today Chris Collison handed over the first iteration of the manuscript to Facet Publishing. The countdown begins to the May publication date. The past 3 months have been hectic as Chris Collison, Patricia Eng and I raced to meet a publisher deadline of 31st January. I’ve enjoyed the discipline of conducting interviews and turning them into chapters that showcase their KM activities. I’ve also enjoyed working virtually as a team even though bandwidth in Chile and at some airports can be a challenge (Patricia is touring South America and Chris spends more time on planes than I do). It all begun over dinner as most good things do. Having run a joint Masterclass in Lisbon in May 2017 Chris Collison and I were sitting in a restaurant overlooking the River Tejo supping a wonderful Alentejo Red wine enjoying Arroz do Marisco (Portuguese Paella). Over the next 6 months we had a number of discussions culminating in a decision to go ahead and write a book using the release of the ISO KM Standards as a backdrop. A book that makes no promise to help the reader ‘pass’ an assessment, more one that draws on great examples from leading global organisations and highlights aspects from their KM Programmes others might find inspirational. 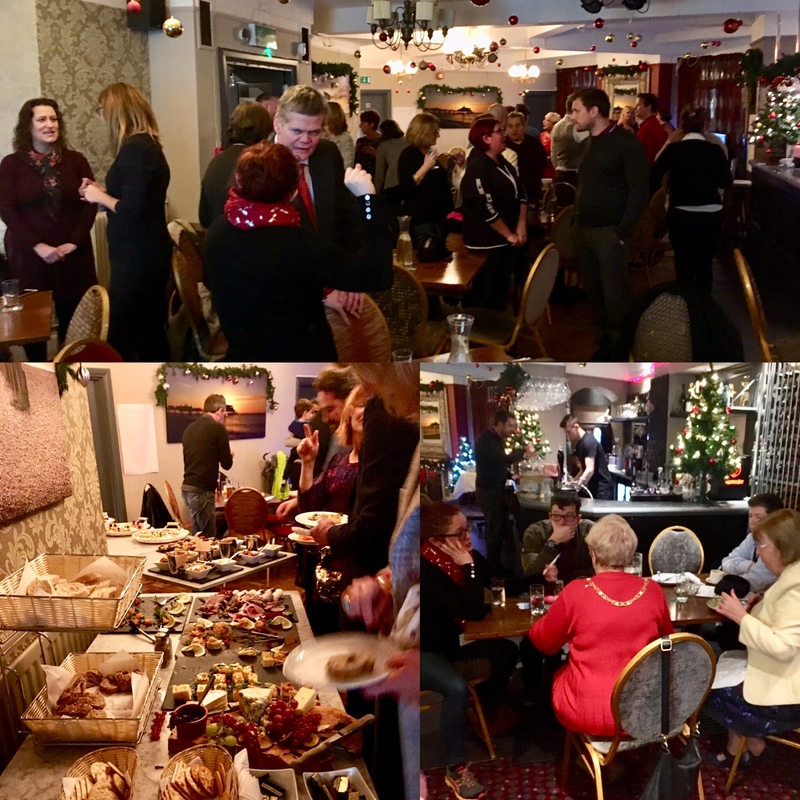 There have been so many interesting stories and reassuringly endorsement of the importance of the “8 ‘ates (soft skills essential for KIM’ers) I’ve spoken about and led masterclasses on. It’s also been interesting to learn that one organisation has aligned it’s own KM consultancy effort to the new ISO 30401 KM standard. The KM Cookbook serves up a menu of success stories and strategies for organizations wanting to know more about Knowledge Management Standard ISO30401 – whether they intend to pursue certification, or simply seek to use it as a framework to review their existing programme and strategy. Knowledge Management (KM) has been around for over 20 years as a set of tools and methods for connecting, collecting and creating knowledge. Lots has been written, and there are tens of thousands of practitioners out there—in-company specialists and consultants. Unlike Lean, Agile and other business improvement methodologies, KM has never had a single agreed set of tools, or a commercial accreditation or standard. Attending a KM conference can feel a bit like visiting an international street food market! In many ways, the arrival of an internationally agreed standard and vocabulary, imbues fresh professional credibility and to the field of Knowledge Management. It provides knowledge managers with a ‘brand-new kitchen’, and a moment during which they can pause for a moment and consider the service that they provide to their organisations. For a potential restauranteur who has gone beyond casual street-food and is looking to sell a service to customers, the challenge – and the opportunity – is to provide a distinctive offering with consistency and professionalism. To do that successfully requires a number of elements: credible reputation, premises, staff, tasty and appealing menus and recipes, compliance with relevant food hygiene standards, and, of course, blood, sweat and tears. And at the heart of it all, with its appliances, utensils and food stocks, is the restaurant kitchen. 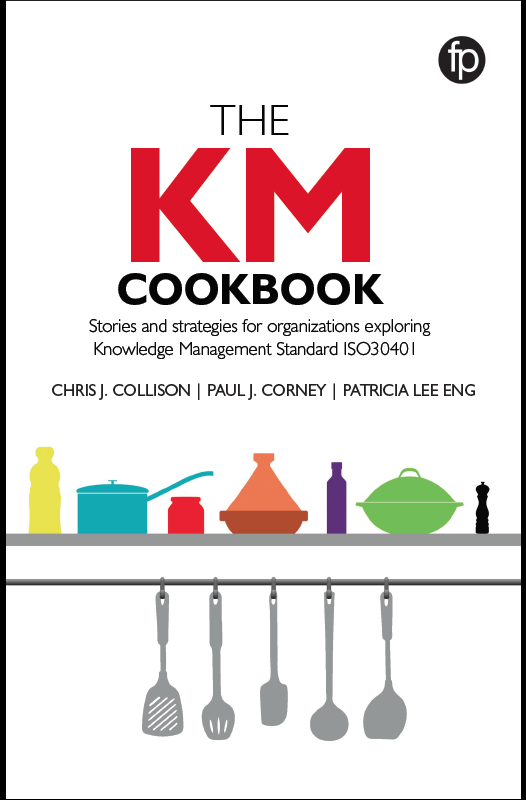 In the KM Cookb ook, we use the metaphor of the restaurant, its cuisine, owner, chef, staff, ingredients, menu-planners, customers – and a restaurant critic to serve up ISO30401 on a plate for the readers. 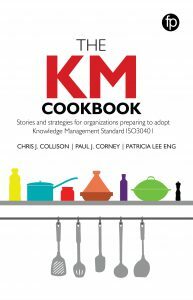 The second half of the book explores sixteen different examples of KM in practice, through the words of their ‘KM chefs’. Imagine you had the opportunity, not just to enjoy a new, well-equipped and fully inspected kitchen – but also the chance to sit down with KM ‘chefs’ from around the world, across different industry sectors and listen to their stories. That’s exactly what we have set out to do with the KM Cookbook. Our aim has been to produce a highly readable, slightly tongue-in-cheek dinner companion for a wide readership. We hope anyone looking to see how Knowledge Management can make a difference to their business will enjoy this as a good read and that KIM Professionals, Senior Management, Quality Management and Human Resource Professionals will find much of specific interest to them. Draw up a chair – we hope you’re hungry! Take a good look at this 500 Krone note. In 2 years time you are unlikely to see one. Sweden is going cashless which makes you wonder what will happen to the cash machines. I found out about this evolving policy by chance having withdrawn Skr !,500, enough I thought to pay for taxis and a few snacks. My first attempt at using cash was to settle the taxi fare on my way to a Masterclass. I discovered I could pay Kr 500 but no my driver didn’t have change (Kr 250). So on my walk back to the hotel I go to the Tourist Board to ask how to use the money in my pocket. Though keen to help they were unable to tell me the names of places that would take cash! Undaunted on check out I got out my ‘spare’ cash to pay part of the hotel bill: “We are a cashless hotel” I was informed. I pointed out a potential issue for tourists or business people paying with a card. We will be charged a non sterling transaction fee. I was assured we wouldn’t. I was, £14 on a bill of £500. The technology is in place but the implementation process and how it impacts everyone is far from nailed down. 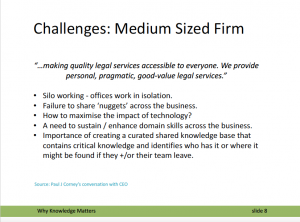 Which is a good segue to my observations from 3 days with the Legal Industry. My visit began at this event which was a sell out. 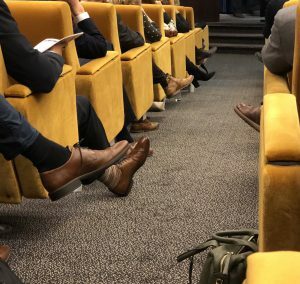 Very much set up to be “show & tell” it follows a similar format to many with a list of speakers comprising practitioners, vendors, and thought leaders. Loving the L’Oreal story from @AndrewArruda. Old established company buys AI start up to help potential customers envisage what make up might look like on them. No mention of augmented or virtual reality which some are experimenting with for training. That the predominant shoe colour was brown! More dialogue and more interaction. The conference style set up mitigates against conversation. Even though there were three breaks for informal networking they were in the exhibitor areas with limited seating or breakout space. As the final exercise proved the demand was there! The vendors (who were given a few minutes to introduce themselves before the recess they’d sponsored) use a story to illustrate what they do. It is not really helpful to tell people how many clients you had in 2016,17 and 18. And I don’t need to know when you were established. Obsess about automating everything that can be automated to free our resources for more fun work! “If you don’t automate your work you will be out of work”. So says Google. They would of course but in this case they are right. We as #Lawyers are not threatened by the new technologies, our ways of working will get less #robotic and digital solutions will enable us to concentrate the actual #expertise work. Fascinating: recruitment consultant confirms legal firms are looking for “humans”- people with soft skills who are good at collaborating. I spoke about a recent conversation with the CEO of a firm looking to acheive rapid growth. I examined the challenges I thought they faced. 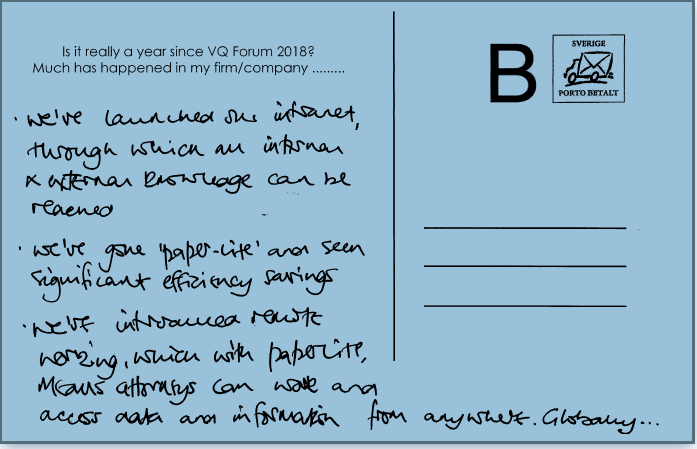 I shared a number of postcards from the future provided by vendors and legal practitioners. Thank you for your fantastic presentation at #VQForum! And the postcard exercise was a true success! 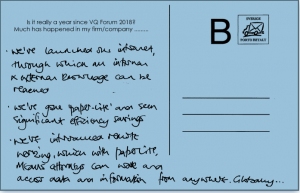 It had become apparant from preparatory conversaations with Carolina of Venge (the organisor) and at VQ Forum that many KIM professionals face challenges assoicated with “finding stuff”, getting senior management support and getting their organisations to work more collaboratively. It was one of the most enjoyable masterclasses I’ve run due to the willingness of the participants to engage from the start. A new day of intense learning. Loads of new ideas. Thanks @PaulJCorney for a great KM masterclass. Key take aways as of now. Focus – and a bit of back to basics (that might get lost in this tech era). Facilitating IS a critical skill. And the importance of a good elevator pitch. The best take away was definitely the elevator pitch. I will also try to become a “knowledgeur”. I liked that title! Noted down back-to-basics and a new skill set (or more professional words for the skills anyway ). And the focus on facilitating and curating. Thank you! I liked the idea of GIVE >< TAKE – to ask people what skills and knowledge they bring, and not only what they expect to take away. So simple, but I’ve never thought about it before. In the past i’ve spoken about the idea of Knowledge Matchmaking so I was delighted to be able to link up a couple of people who had similar interests / experiences. 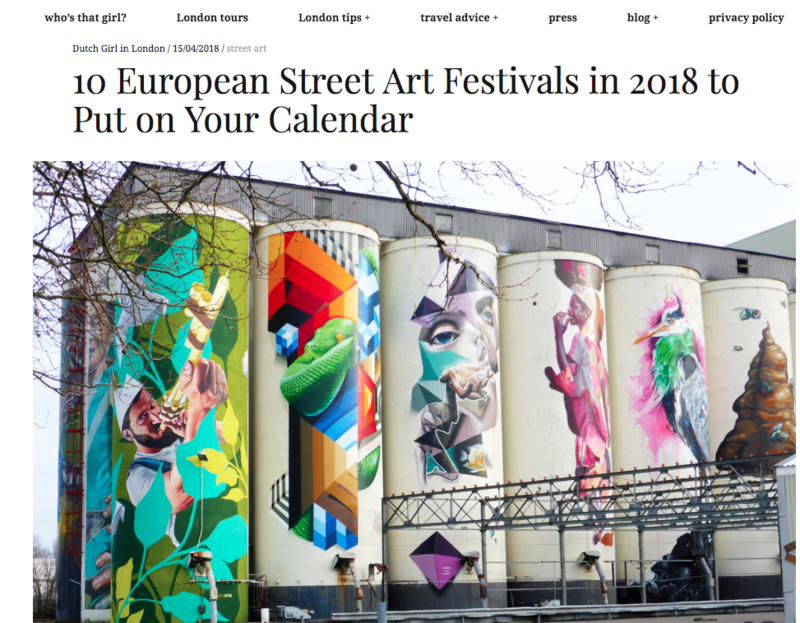 I too was the beneficiary of an introduction via Ann Bjork one of the organisors to the Head of Stockholm’s Art Department with whom I had a most enjoyable breakfast discussing the city’s Urban Art programme before I left on Friday. The previous evening I had dinner with a LinkedIn contact who I’d met at a previous event. We live in a connected world and have the ability to make the most of networks but it requires us to reach out in the first place!